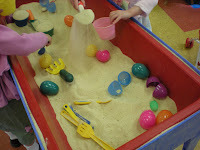 Today was Easter Party day for our three-year-old class. The weather was not as great as it could have been--it was down right cold, but we still had a wonderful day. 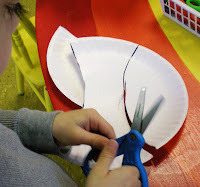 We made our wonderful Paper Plate bunnies. My cutters are just so great now! 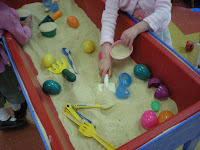 I had plastic eggs in the sand table for them to play with. 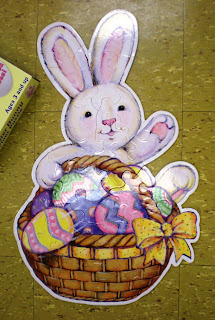 The most wonderful part of the day though was our visit from the "Easter Bunny." We didn't get to see him, but he came and hid eggs and filled our Easter Baskets. 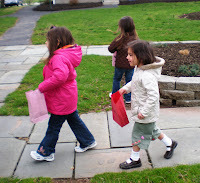 We got to go outside and find eggs and then enjoy all our goodies in our baskets. 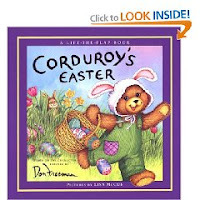 We read a really cute lift-the-flap book, "Corduroy's Easter," by Don Freeman with pictures by Lisa McCue. It's always so much fun to see what's hiding under those flaps. 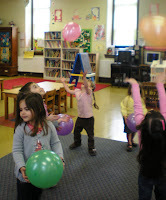 Our final activity for the day was fun with balloons. I bring the balloons in because I think they resemble eggs enough for Easter Play. I put on some music and we have fun throwing and catching, and hitting them high in the air. 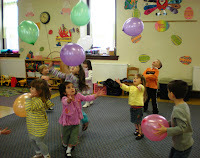 Then they get to take the balloons home. It was a great way to finish off school before break. 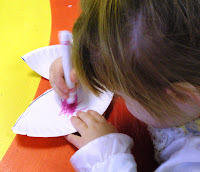 I just love this post and seeing the kids have so much fun. They are lucky to have you in their lives!